Terrinoth is a land filled with great wonders that date to the far past of the First Darkness, but it is also filled with terrible dangers. Ghastly undead creatures, ravenous monsters, ferocious dragons, and horrific demons lurk here as well. Adventurers must always be prepared when exploring forgotten treasure vaults and castle ruins, for it is a certainty that they won't be alone in such places! This deck includes cards for 20 adversaries from all across the varied lands of Terrinoth and beyond. 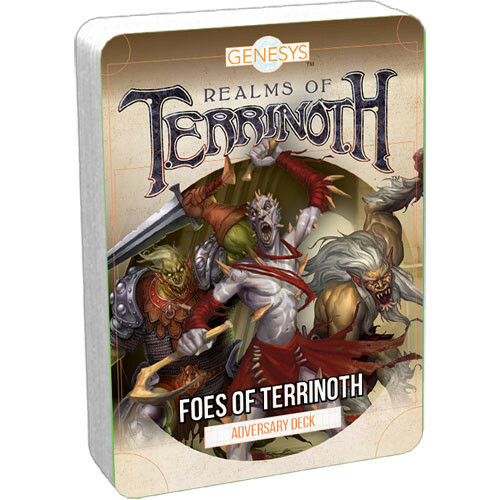 A copy of both Genesys RPG: Core Rulebook and Realms of Terrinoth are required to use this deck.